We left Sainte François at 7am heading offshore to Iles de la Petite-Terre, some 14nm away. We needed a few tacks to get there and we noticed all the day catamarans motored up the coast and then cut across to the Islands under sail, a sensible and scenic way to get there. We got there around 10.30am and we were confronted with a series of breaking waves over the 2m bar that guarded the only entrance into the lagoon. It looked reasonably scary, even with Chris Doyle’s waypoints and mud map (which turned out to be excellent). As luck more than good planning would have it, one of the day catamarans arrived shortly after us and we decided we would follow him in. But not too closely as we didn’t want to surf up his bum. Even with a guide boat it was still exciting, as at one stage Dee goes “go, go, go” as the breaking swell threatened to catch us. With the two 75HP engines foing at full tilt we were able to run with the wave as it slipped under us. Then we were in. The lagoon is absolutely stunning – a picture perfect setting with crystal clear water, white sandy beaches, shaded with palm trees. My idea of heaven. With a reasonable strong current running through the mooring field, we had trouble picking up one of the National Park moorings until one of the tour boat guys came over in his dinghy and helped us tie on. Then we went for a swim to explore the island. 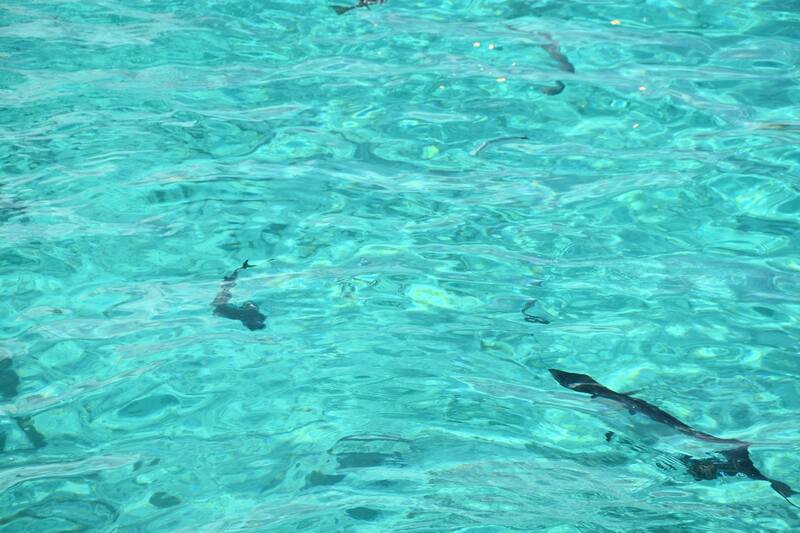 Whilst on the beach we saw a small sand shark swim by and numerous turtles. Back at the boat, we saw a single-handed Polish two ended ketch come in and proceed to the shallows where he got stuck aground. We dinghied over to offer assistance and went off to find the ranger to help pull him off. He claimed his guide-book showed an anchorage there. By the time we got back to him, he had managed to reverse out of his predicament and was busying his anchor. There’s no anchoring in the lagoon as the National Park has provided ample numbers of moorings so we told him no and helped him on a mooring. Next minute we hear shouting from the day catamaran as he has got his spear gun out to catch himself lunch. I’ve got to say that his Polish Guide book is a little out of date perhaps. Dramas over, we got our snorkels and fins on and went exploring. Before we could even jump in we saw a barracuda, a couple of large jacks and a box fish off the back of our boat. This continued for the rest of the snorkel with another barracuda, a large sting ray and lots of reef fish and coral to look at. Later in the day, we took the dinghy in and went for a nice sign-posted hike around the lighthouse and out to the western point. Got some nice photos of the view, and the ten million iguanas that sun themselves on the path. As darkness fell, the fish came out to play. There was a bit of a current running through the mooring field and a school of large fish camped themselves beside the boat and gently swam against the current, occasionally snaffling smaller fish that floated past. Fascinating. We tried dropping a camera over the side on a selfie stick but it was just too dark to pick up anything. Then at about 8pm we saw a small catamaran come over the bar and into the lagoon. Pretty gutsy (or possibly stupid) effort. Next morning, we woke to a calm sea with not much action on the bar. This had a huge calming effect on the skipper who quickly ordered stumps to be drawn and off we went across the bar with minimal excitement, heading back to St Francois, via the scenic route along the coast. This entry was posted in Guadeloupe and tagged Iles de la Petite-Terre by stull61. Bookmark the permalink. Love your last two posts!! You are great at describing everything, a gift for writing!! see you both soon! !